Engineers and designers are giving commercial aircraft a makeover, in a bid to make them faster, greener and more efficient. Look up into the skies today at a passing aeroplane and the view is not that much different to the one you would have seen 60 years ago. Then and now, most airliners have two wings, a cigar-shaped fuselage and a trio of vertical and horizontal stabilizers at the tail. If it isn’t broke, the mantra has been, why fix it, particularly when your design needs to travel through the air at several hundred miles an hour packed with people. But that conservative view could soon change. Rising fuel prices, increasingly stringent pollution limits, as well as a surge in demand for air travel, mean plane designers are going back to their drawing boards. And, now, radical new shapes and engine technologies are beginning to emerge, promising the biggest shake-up in air travel since de Haviland introduced the first commercial jet airliner in 1962. Earlier improvements went mostly unnoticed because they focused on building better and quieter turbine engines with higher performance and improved fuel consumption. There have also been huge strides in computer controls and fly-by-wire systems, which make a big difference to the pilot, but not to the passengers. And in recent years, the biggest development has been the use of strong, but lightweight plastics and composite materials rather than metals, reducing the weight of planes and the amount of fuel they need to burn. This has also allowed the development of “radical” new planes like the giant Airbus A380 and the Boeing Dreamliner. But despite these advances, aviation engineers know there is still much to be done. Take fuel prices, for instance, which have soared in recent years. Despite modern planes being 60% to 70% more efficient than those built 60 years ago, aviation fuel expenditures now account for a quarter of an airlines operating expenses, placing them on a par with labor costs. In 2011, large US air carriers paid half again as much for fuel as what they paid in 2000. Add the fact that global airline travel is expected to grow to 3.3 billion annually by 2014 (up one third from 2009), and it’s clear why engineers are searching for new ways to boost performance. 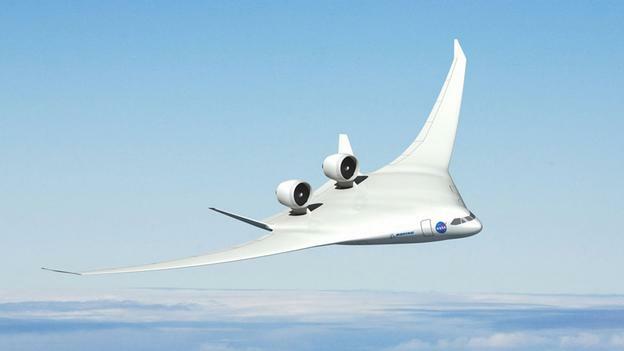 One of the biggest efforts to rethink the airplane is being conducted by Nasa’s Subsonic Fixed-Wing program, a collaboration between the US aerospace agency and industrial partners including Boeing, GE, Lockheed Martin, Northrop Grumman and Pratt & Whitney, as well as academic institutions such as Massachusetts Institute of Technology. “We’re looking to see if we can develop technologies that can get us yet another 60 to 70% improvement in fuel efficiency,” says Wahls. In addition, the project wants to engineer new designs with a 71-decibel decrease in noise emissions and a four-fifths fall in nitrogen oxide pollutants from current standards. And, if these kinds of goals weren’t already aggressive enough, the team wants any new technology to enter service between 2030 and 2035 - a mere blink of an eye in an industry in which commercial aircraft can have multi-decade life spans. “We are trying to determine which technologies are worth pursuing; those that might get us anywhere near our goals,” says Wahls’ boss, Ruben Del Rosario, subsonic fixed-wing program manager. Planes under investigation by Nasa range from the extreme to the slightly more conventional. For example, Boeing’s Sugar Volt is a design that came about as part of the manufacturers Subsonic Ultra Green Aircraft Research (Sugar) project. The design – like many new concepts - is based around the idea of maximizing the plane’s lift. This reduces the amount of power needed to keep the plane in the air, as well as the amount of fuel it must burn. The Sugar Volt does this by using very long, narrow, flexible wings. They are so long that engineers needed to brace them with under-wing truss support struts, making the aircraft resemble the Piper Cub and other light, high-winged planes. The SugarVolt’s wings are extended in order to increase lift, allowing shorter take-off distances and requiring less power in flight. They are so long, in fact, that the Boeing designers may have to fit them with hinges so that they could fit in existing airports and boarding gates. There are, however, are other ways to improve performance than just making longer wings. A team from MIT in Cambridge, Massachusetts, for example, put forward the D8 for consideration by Nasa. This “double-bubble” aircraft design, features a double-wide fuselage composed of two standard body cylinders melded together side-by-side, as well as low-swept wings that cut drag and weight. The idea of the wider body shape is to increase lift generated by the fuselage, rather than it being mostly dead weight slung between two wings. The extra lift and reduced drag cuts back on the quantity of fuel that the engines must burn. If the jet were built today from standard aluminum alloys it could provide a 50% reduction in fuel use, according to the MIT designers; a low-mass polymer-composite version could give 70% efficiency gains. In addition, because the D8’s turbine engines sit on top of the fuselage in a box-shaped tail, they would cut the amount of engine noise broadcast to the ground. The D8’s idea for generating greater lift is taken to an extreme in another design called the N3-X hybrid wing-body airplane, which Nasa developed in-house. At first glance, the N3-X looks a lot like a so-called flying wing design, used by planes such as the US Air Force’s B-2 stealth bomber. These comprise a single, thick triangular wing that enclose all of the plane’s contents - cockpit, stores, engines, fuel tanks and flight surfaces. But, unlike the B-2 flying wing, the N3-X hybrid wing-body also features two thin, rather conventional wings attached to the sides of its ultra-wide fuselage. The primary advantage of the hybrid, or blended, wing-body design is better fuel efficiency, Del Rosario says. Like a flying wing, the hybrid aircraft produces lift with its entire aerodynamic airframe, thus ridding itself of the drag associated with the cylindrical fuselage and the tail surfaces of a conventional plane. As with the D8, the more lift that can be produced overall, the less effort is needed from the engines, which in turn means less fuel must be burned. Fuel efficiency could be raised further by building the airframe from lightweight polymer composite materials instead of metals, Del Rosario says. Engineers are aware, however, that new airframe shapes will only get them part of the way to their goals. To really make a difference, particularly to fuel consumption and engine noise, planes will also need radically new propulsion systems mounted or integrated into the airframe in novel ways. And, like car designers, aircraft manufacturers makers are beginning to explore the possibilities of electric and hybrid engines. Boeing’s Sugar Volt concept, for example, would use a hybrid-electric propulsion system that combines fuel-burning (turbine) engines, electric motors and electrochemical storage batteries—a propulsion concept not totally unlike that inside a Toyota Prius. The hybrid system would let the operators choose to draw engine power from the turbines or the batteries, whichever provides the most benefit for the specific segment of the flight—takeoff, landing, cruise, and so forth. “You can envision a 737-class airliner using the combination of turbine and electric power for take off and then, depending on the situation, switching over to cruise on one or the other,” says Marty Bradley, principal investigator for subsonic ultra-green aircraft research at Boeing Research and Technology in Bellevue, Washington. Nasa’s N3-X is also designed around a completely new engine concept, called turboelectric distributed propulsion. It splits the main functions of a standard turbine engine in two - generating power by burning fuel and creating thrust by blowing air rearward with a large fan. The idea is to use two large turbine engines to drive electric generators that would produce electricity to power 15 electric motor-driven, thrust-producing fans that would be embedded across the top rear of the broad fuselage. Such a configuration could be very efficient, Del Rosario says. The array of small electric propulsion fans at the stern of N3-X enables the designers to cut drag significantly by accelerating the flow of drag-causing air moving over the upper surface of the fuselage, keeping efficiency-sapping air friction at a minimum. Like the D8, the top-mounted propulsor fans would also effectively lower noise emissions because the body would come between them and the ground below. The airliner concept may have an Achilles’ heel, though. For such a system to reach maximum fuel-efficiency targets, the electronics, generators and motors may need to be built from superconducting (zero-resistance) materials, meaning the jet’s electrics would have to be super-cooled by liquid hydrogen at −253C (−423F) or liquid nitrogen at -196C (321F) to make them work. This cryogenic technology is not yet fully practical and could take decades to prove out. Recent studies indicate, however, that substantial fuel-consumption gains could still be obtained by using existing electrical technology running at ambient temperatures, according to Del Rosario. If that scheme sounds far out, other manufacturers are looking at developing fully electric systems for the 2050 time-frame. Aircraft engineers and designers at Eads, the parent firm of Airbus, for instance, have proposed a rather extreme concept called the Voltaire. The bulbous, 50-seat fuselage with two, long slender wings and a giant propeller on the tail, make it resemble a submarine. The concept, first put forward in 2011, would use next-generation batteries to power high-efficiency superconducting electric motors that would in turn drive the giant counter-rotating propellers mounted in a cylindrical shroud at the tail. Unlike any of the Nasa concepts, it is designed to be zero-emission. However, anyone thinking that the electric Voltaire airliner may fly any time soon, needs to think again, says Johannes Stuhlberger, head of the global innovation network, power and flight propulsion at Eads. “The development of electric aircraft not only depends on the speed at which battery technology improves, but also how fast electrical equipment - the motors - get better.” Electric motors would need efficiencies of around 95%, he adds, noting that for any new system to become a reality will require “tremendous improvements in the power-to-mass ratio of the entire propulsion system, while still keeping it affordable. In the shorter term, engineers at the Airbus group are trying to reduce fuel-consumption emissions by developing novel launch systems, similar to those found on naval aircraft carriers. In one radical concept, a low-slung carriage vehicle with an airliner mounted on its back would accelerate down the tarmac and loft the plane into the air. Such a device would substantially reduce the initial power required for a passenger plane to take off. Airbus envisages the eco-climb system moving into position automatically and assisting airliners to climb steeper and reach cruising altitude faster and from shorter runways. Of course, all of these developments will undoubtedly lead to changes in the passengers’ in-flight experience. Catapult take-offs will likely mean passengers will be thrust back into their seats more firmly than happens now. Ultra-wide bodied planes will likely mean fewer window per seat for the occupants and their larger seat capacities could also lead to slower passenger-deplaning procedures both at the airport and in emergency landing situations. But there will also be benefits from these new wider spaces, which could, for example, accommodate large communal social spaces for kids more commonly found on cruise ships, whilst quiet electric engines could mean a good night’s sleep for travelers normally disturbed by the drone of turbine engines. “Are the extra carrots in the new designs worth the extra effort and costs they entail?” asks Nasa’s Wahls. Only time will tell. Many of these concepts are just that: concepts that are destined never to become a reality. However, like concept cars that push what is technologically possible on the road, these craft will probably inform the design of future airliners. So, when you gaze up at the skies in twenty years time, perhaps the airplane passing by will look different from those you grew up with after all.